A lack of focus on small providers, competitive concerns, and shaky standards are among the obstacles in the battle to get healthcare organizations to embrace data sharing. The recent KLAS report calling into question the effectiveness of commercial technologies with regard to patient data sharing among health information exchange (HIE) initiatives was a good illustration of just how complex it is to establish a local or regional data exchange, much less a fully functioning national HIE network. In “Health Information Exchanges: The Reality of HIE Adoption,” KLAS examined 89 live HIEs utilizing commercial technologies to share patient data among facilities that were not owned by the same organizations. The report found that just a small number of vendors have established a proven, repeatable model for data exchange, with most of the 22 vendors evaluated having one to three validated sites. “The eclectic way that clinical information is structured, stored, labeled, and shipped makes it very difficult for vendors to connect all of the discrete data elements. In the majority of cases, HIE vendors are opting to pass around packets of information without necessarily taking ownership of what is in the packet,” said author Jason Hess, KLAS’ general manager of clinical research, in a release about the report. HIEs may be one piece of healthcare’s data-sharing puzzle, but the challenges confronting these local and regional organizations are shared industrywide. The problem is not just technology. If the industry ever hopes to have a free flow of patient information across and between providers, it must broaden its focus beyond the large provider organizations that have received the lion’s share of attention. “There has been a lot of work done in the past decade to address interoperability in healthcare, but much of that work has focused on helping large organizations exchange data with other large organizations. Though this is critical, it leaves out large groups within healthcare,” says Vish Sankaran, program director for the Federal Health Architecture Program. He notes that approximately 40% of the current healthcare market consists of smaller providers who also need to exchange data with other providers, labs, and pharmacies. “For them, simpler, easy-to-install and -use solutions are important. Most haven’t had the funds to buy and implement electronic health record systems at all, let alone make sure their systems are interoperable with other organizations in healthcare,” Sankaran adds. In addition to expanding its focus to include small providers, the industry must address the administrative, governance, and cultural barriers that are slowing progress. Also important are the lack of standards and the structure of patient data itself. The complex nature of health information is not only its own barrier, but it is also a contributing factor to several others. For example, while standards governing the actual exchange of information have been in place for years, they do not yet exist in a meaningful way at the granular content level. As a result, there are wide variances from one vendor application or health system to the next concerning how patient data are captured and stored. This creates a significant challenge for providers that want or need to share data at anything other than a very high level. Sankaran concurs that standards play a critical role in achieving interoperability. However, it’s not a lack of standards but too many that he views as the greatest challenge. “We need to narrow the field of standards to those that best support the needs of a wide variety of stakeholders. If we can do that, we will make large strides in interoperability much more quickly,” he says. The scope and nature of the data contained within medical records also create barriers to data sharing in the form of privacy concerns. One of the most common is that sensitive information, such as information regarding mental illness or substance abuse, can be used to deny or terminate insurance coverage or employment. A second concern is that the information found within an individual’s medical record leaves patients susceptible to financial and medical identity theft. Because they contain everything from insurance information and Social Security numbers to home addresses, places of employment, and even the names of spouses, siblings, and parents, a single medical record can fetch as much as $70 on the black market, according to an estimate by the World Privacy Forum. As a result, data exchange is subject to a sundry list of regulations that make it difficult for providers to be comfortable that the data being shared are managed in a legally compliant manner. HIPAA is “a national guideline for sharing information, but then each state has the right to impose different requirements. If the state requirement is higher, then the state rules,” says Spooner. “So you don’t have a common basis for patient consent. That makes it difficult not only when you consider a specific transaction but also when calling upon a software vendor to tailor its system to support multiple sets of privacy requirements. “I think that data sharing will evolve as standards become more prevalent, but I do think we have to solve the privacy issues first,” he adds. Standards and privacy regulations are significant challenges, but they are just the tip of the iceberg in terms of obstacles on the path toward widespread data sharing. Some consider the structure of the industry itself to be a barrier. That fragmentation makes it difficult for any kind of standardization to take hold—standardization of data collection and care practices that is critical to effective data sharing. Jarvis also notes that because of the relative youth of the EHR movement, the industry has not yet established a comprehensive view of the precise types of information that will prove most valuable in the identification of community health trends. The same is true of which types of data should be shared at the patient level to best promote effective care. Equally important to eliminating the obstacles to widespread data sharing is identifying ways to overcome competitive concerns that prevent many healthcare organizations from willingly exchanging patient information. 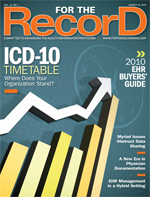 Broader EHR adoption, consistent privacy regulations, and enhanced data standards can resolve many issues, but they do little to overcome the governance, financial viability, and sustainability concerns that leave many provider organizations hesitant to make the investments necessary to expand their data-sharing capabilities beyond their affiliates and partners. “Some of the problem is that hospitals and physician practices, to some extent, are afraid of sharing data for competitive reasons,” says Jarvis. “I hope that professionals begin to realize that it’s better to share this data and then compete on how you use all the common data to care for and service your patient. Once medical providers begin to think this way, we in the HIT vendor community will have no desire to avoid interoperability. “I hope as people begin to realize that it’s better to share this data than not, we get to a point [past this]. It’s also with HIT vendors,” he adds. Even if competitive fears are eliminated, there are other issues that hinder the adoption of technologies necessary to share data. Specifically, even as more organizations warm up to the concept, many remain unconvinced that data sharing is a smart business strategy. Part of identifying the business models that will help make data sharing financially sustainable and appealing is also recognizing there is certain information that, when shared, can have a significant impact on the provision of appropriate care. But that information is not, nor should it be, exhaustive. For example, when a patient presents in the emergency department, it is valuable for the clinical staff to know allergies, medications, current or recent diagnoses, and enough personal information for an accurate identification. Less helpful, and therefore less appealing as part of an investment into data sharing, is accessing information that has little or no bearing on the current situation. For Martich, one solution to the many challenges confronting widespread data sharing is employing the federated model of information exchange. This allows providers to maintain control over their data but still enable sharing with other organizations by providing dynamic access with preset administrative controls. Indeed, many believe that consumers play a critical role in advancing interoperability and data sharing. Jarvis points to the inroads made by Google in tracking and predicting flu outbreaks based on user search results, as well as stimulus fund eligibility requirements that call for physicians to make records available electronically to patients within 48 hours. In the more immediate future, most agree that the HITECH Act will provide the greatest incentive to provider organizations of all sizes and shapes to make the investment into EHRs that are capable of securely exchanging key patient data. That, coupled with more attention paid to the needs of smaller provider organizations, will serve to move the industry forward. It’s inevitable. Whenever the subject is interoperability, information exchange, or data sharing, a comparison is raised between healthcare and banking—most notably the ubiquitous ATM. If we’ve all accepted that those little kiosks can be trusted with information on our monetary value, why can’t we do the same with our healthcare information? While those of us who cover this industry on a regular basis enjoy asking the question, the reality is that ATMs and patient records are an apples-to-oranges comparison the healthcare industry would prefer to see eliminated from the data-sharing discussion. Vish Sankaran, program director of the Federal Health Architecture Program, points out that there are two key differences between healthcare and banking: aligned provider incentives and a strong consumer push. “In healthcare, progress has been occurring in the upper end of the market, among large providers, government organizations, and payers. The challenge lies in the fact that true health IT interoperability requires widespread participation throughout the industry. That’s been a challenge for small physician’s offices,” he says. Sankaran goes on to say that healthcare also lacks the direct link between consumer and provider that the banking industry enjoys. Instead, the insurance industry acts as an intermediary—one that influences the care provided and demanded.